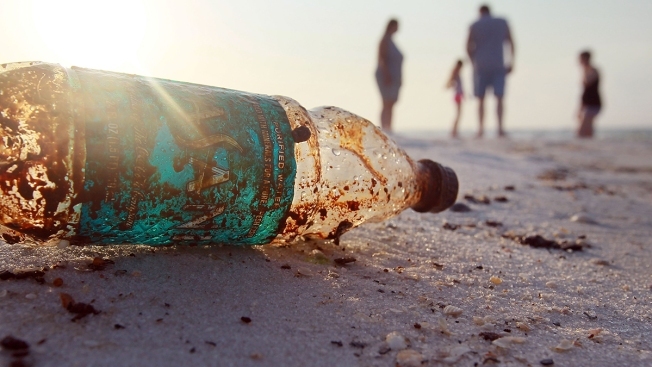 In this undated file image, a plastic bottle is shown on a beach by the ocean. Marine officials say some 80 pieces of plastic weighing 17 pounds were found in the stomach of a whale that died in Thailand. A marine official said Sunday that some 80 pieces of plastic weighing 17 pounds were found in the stomach of a whale that died in Thailand after a five-day effort to save it, NBC News reported. The pilot whale was discovered on Monday in a canal in the southern province of Songkhla and received treatment from a team of veterinarians. The whale spit out five plastic bags on Friday and later died, the Marine and Coastal Resources Department said on its website. An autopsy found another 80 bags and other plastic items weighing more than 17 pounds in the whale’s stomach. Jatuporn Buruspat, head of the department, said the whale probably thought the floating plastic bags were food.